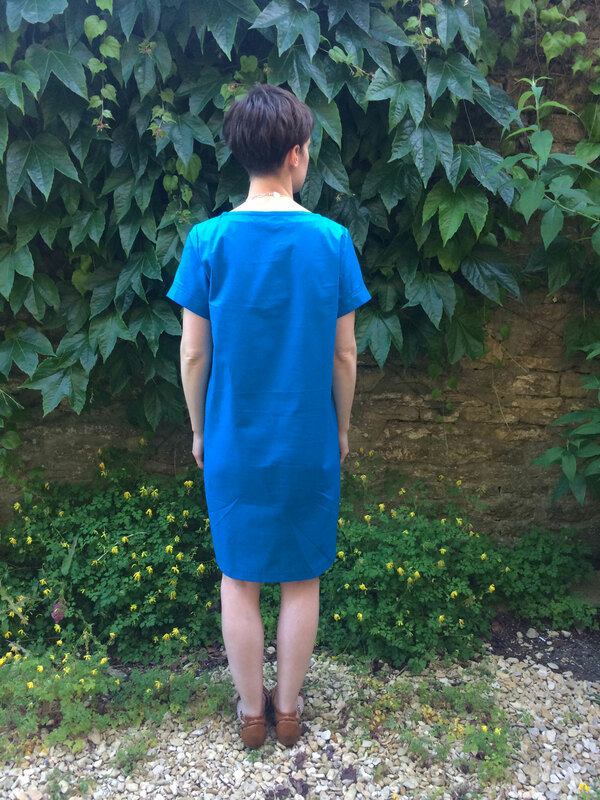 I used the Simplicity K1108 pattern which came free with Sew Magazine, which I only buy when there is a pattern I want to make. 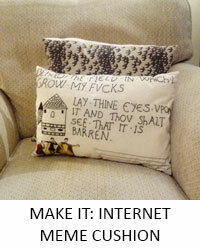 I can’t remember when it came out, but I knew I wanted to make it and I waited for the perfect fabric. 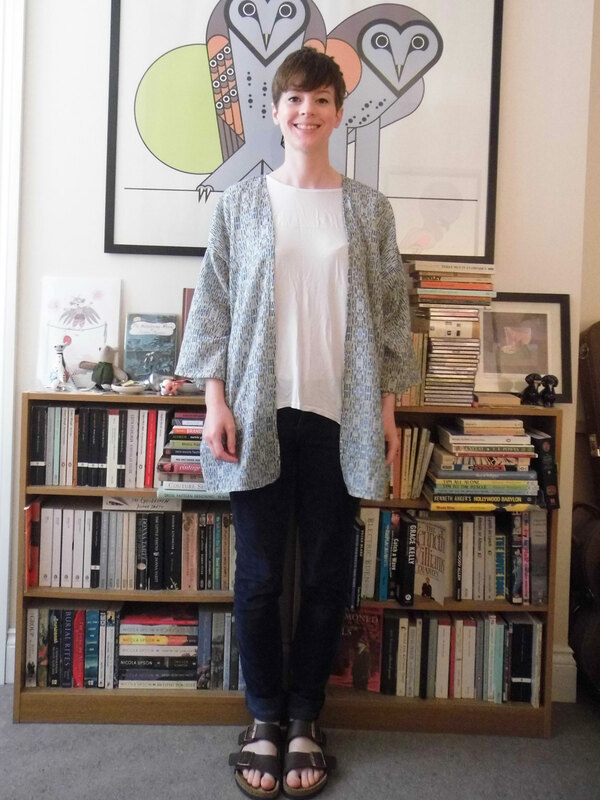 I actually found this cotton lawn on a couple of websites last year when I was looking for fabric for the culottes I made for the New Craft House Summer Party (though I realise now it wouldn’t have worked) but it was sold out everywhere, so when I saw that Harriet had it in stock I bought it IMMEDIATELY! 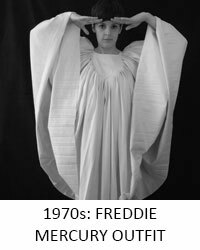 I made the size medium and cut it at a length in between view D and C – they’re the versions without the more bat-wingy sleeves as they’re not so much my style. Here is a close up of the gorgeous fabric! It fits perfectly into my colour palette. The pattern is really simple to make – definitely a good make for a beginner. The only tricky bit was the bias binding around the whole neckline – and that was only tricky because I made my own bias binding using this brilliant tutorial from Helen from Stitch My Style and didn’t do the most accurate of measuring, so my binding was a bit too narrow in places so it was impossible to enclose all of the raw edges in places. I cut a couple of wider bits from the leftovers and just put them over the top of the narrow bits, it’s a bit shoddy but it worked. Sometimes you just have to bodge it! I did manage to wear this once before the weather got a bit chilly! 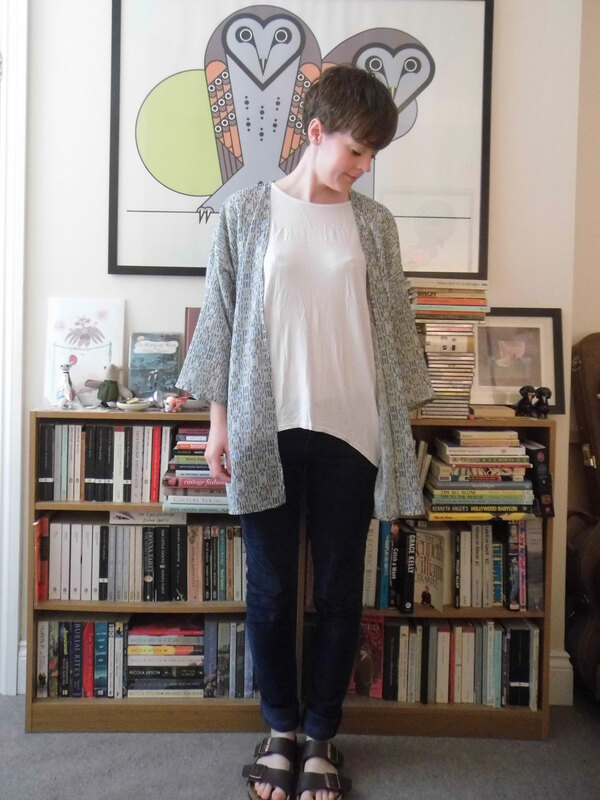 And I was promised that September would be warm, but so far it’s not really warm enough to wear a thin kimono as opposed to a proper cardigan. Boo. I know that for various reasons some people really didn’t enjoy the heatwave/proper Summer we had in the UK this year, but I am lucky to live in a flat that is cool (because it’s old – the pay-off is that it is also freezing in the Winter) and I work in a place with air con so I am a bit sad that we’re heading back into Autumn and Winter again already.Also I barely got to wear my Birkenstocks! Although I like snuggling up when it’s cold, last year Winter seemed to go on forever and I get a bit sick of sitting at my sewing maching usually in 3 layers, with a hot water bottle and a blanket! 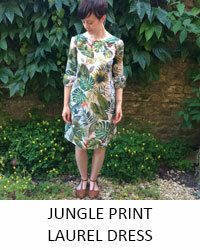 Maybe I need to move to warmer climes…..
Have you ever actually made a free pattern from a magazine? I think this is the first I’ve made and I deliberately don’t subscribe to any sewing magazines because I don’t want to increase my pattern stash exponentially with things I know I won’t make. 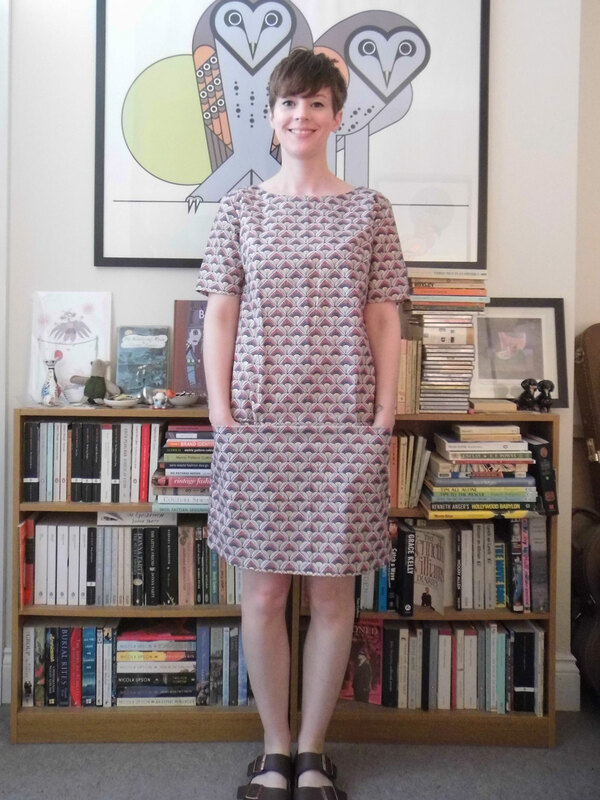 I’ve made another Laurel Dress and I love, love, love it! This is also my second completed make from my Summer plans! 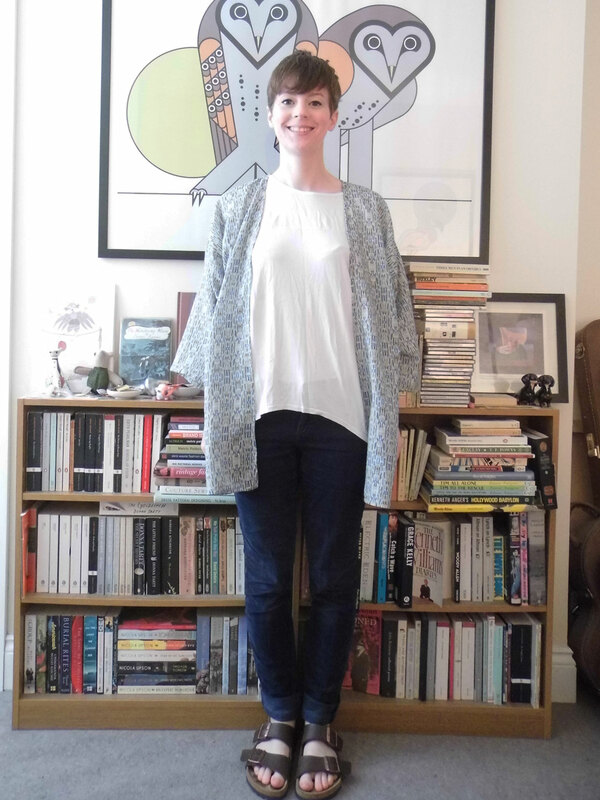 I made this pattern twice before (1, 2), not long after I started sewing my own clothes but I made them too small. 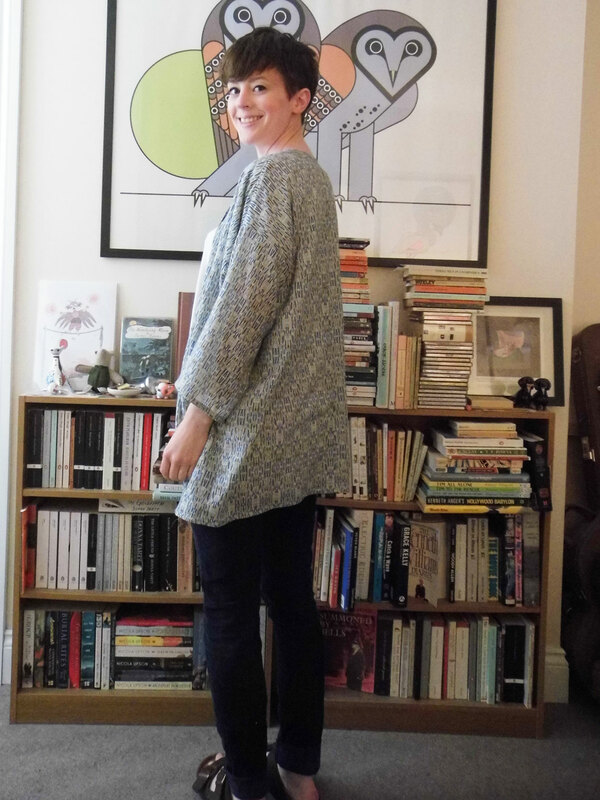 I still wore them around the time I made them because I’d made them and I was proud, but once I discovered more comfortable patterns they soon got neglected and I gave them to a charity shop a few months ago. I made the mistake (I think) of choosing the size closest to my bust measurement, when I know my chest is small so I should choose based on my waist/hip measurement if I want a thing to actually fit, and do an sba if necessary. 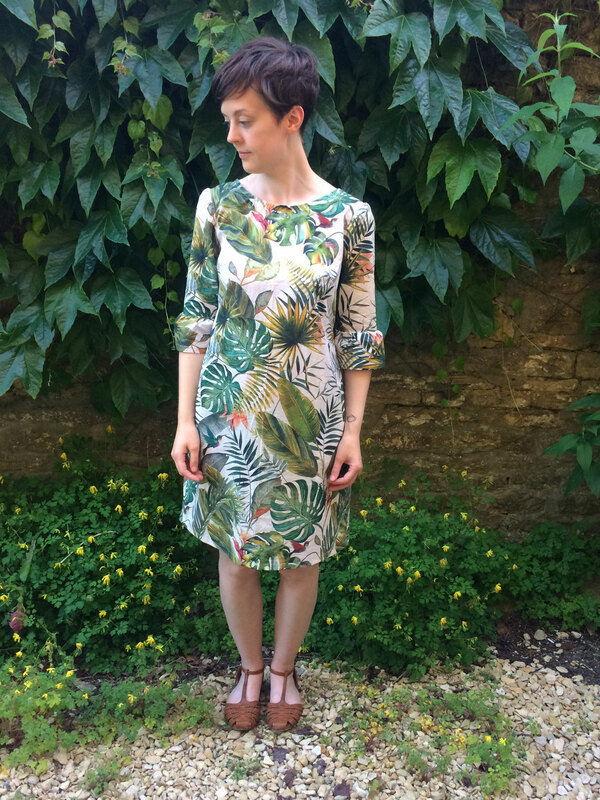 I previously made the size zero (bust 33, waist 25, hip 35) and this time I made the size 4 (bust 35, waist 27, hips 37) and it’s so comfortable, but still looks like it’s the right size across my shoulders – it was the sleeves and armholes that were particularly snug the last time. For reference my measurements are: bust 32, waist 27, hips 37. 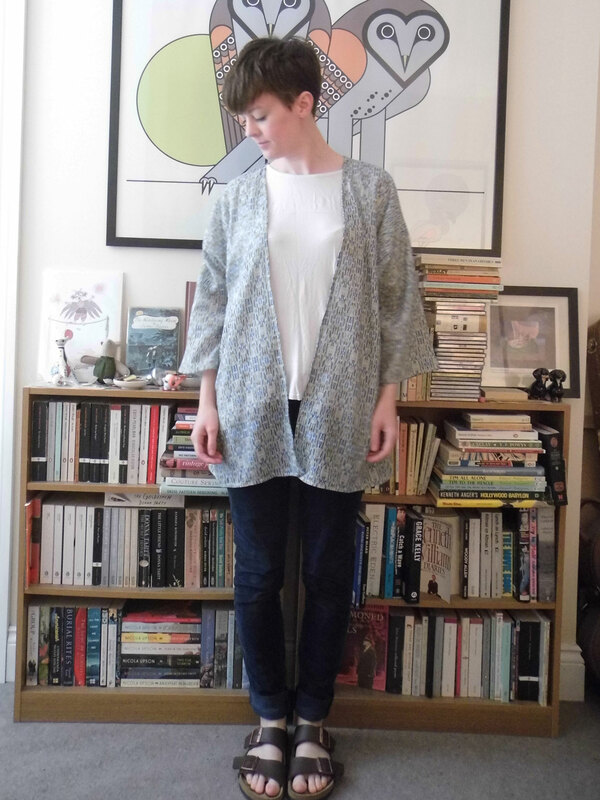 The fabric is some gorgeous cotton lawn from Fabric Godmother, which is sadly now out of stock. 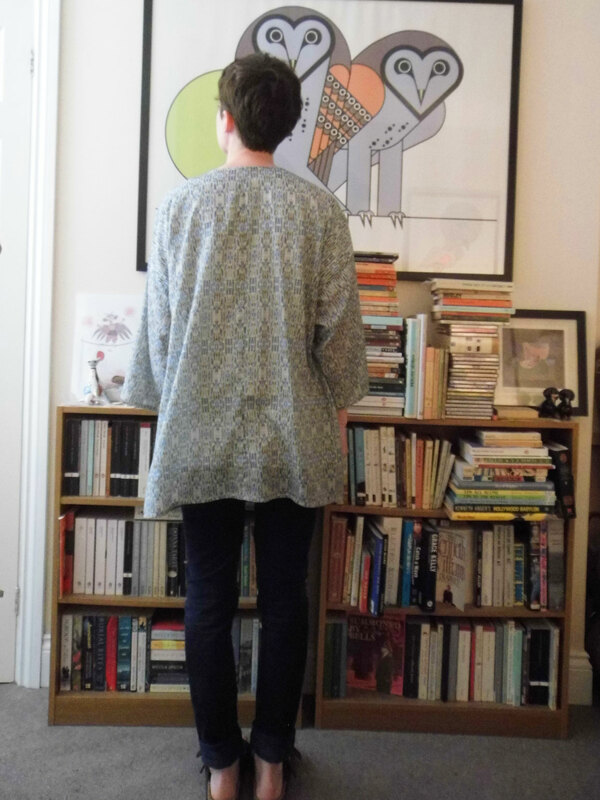 I didn’t really realise that cotton lawns are thinner than cottons so this dress is quite thin, but I think layered with tights, a vest and a cardigan, it will work for the colder weather. 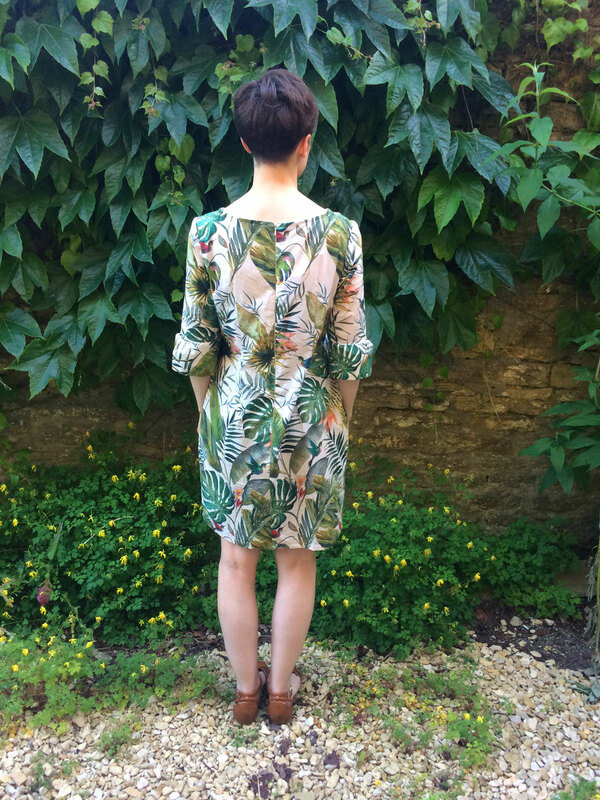 But it’s also a good dress for this warm weather we’ve been having! I added in-seam pockets because I was going to add the patch pockets but I couldn’t really face pattern matching the fabric, so I went for the hidden option! 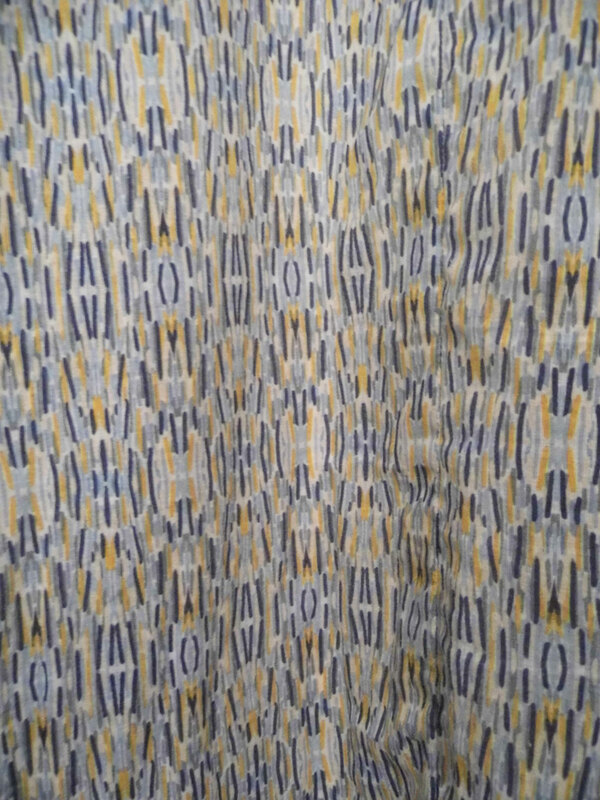 I also made no attempt to pattern match across the back – I figured it’s a large enough design to get away with no matching. I made version 3, which has the ruffles on the sleeves. This pattern is pretty old so I’m amazed it has this option included, since ruffled sleeves have been a trend for a couple of years now! The ruffles are really easy to add, in case anyone is wanting to try it. 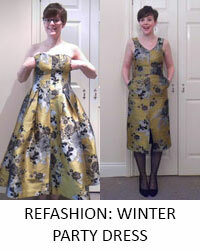 You could also easily add ruffles to another pattern – it’s just a rectangle gathered into the end of the sleeve. 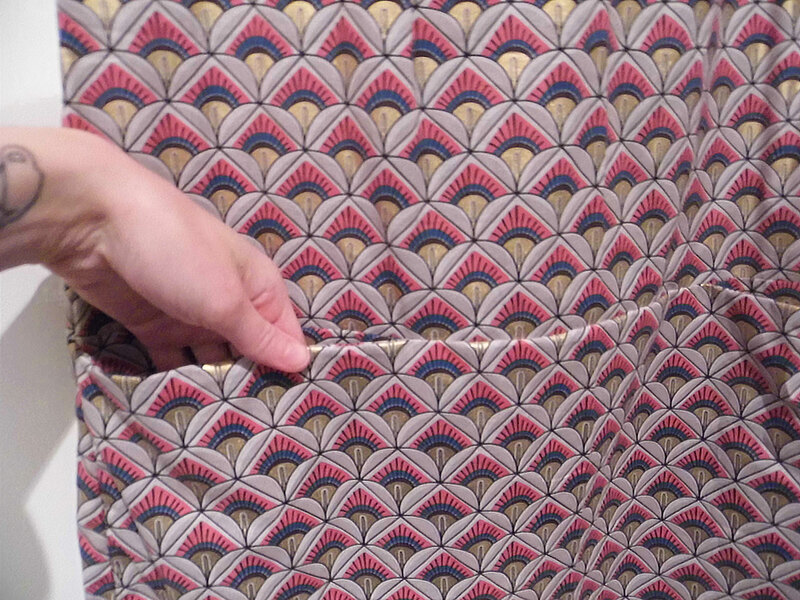 For this pattern there are 2 rectangles for each ruffle which are stitched together to hide the wrong side of the fabric on the inside of the sleeve. 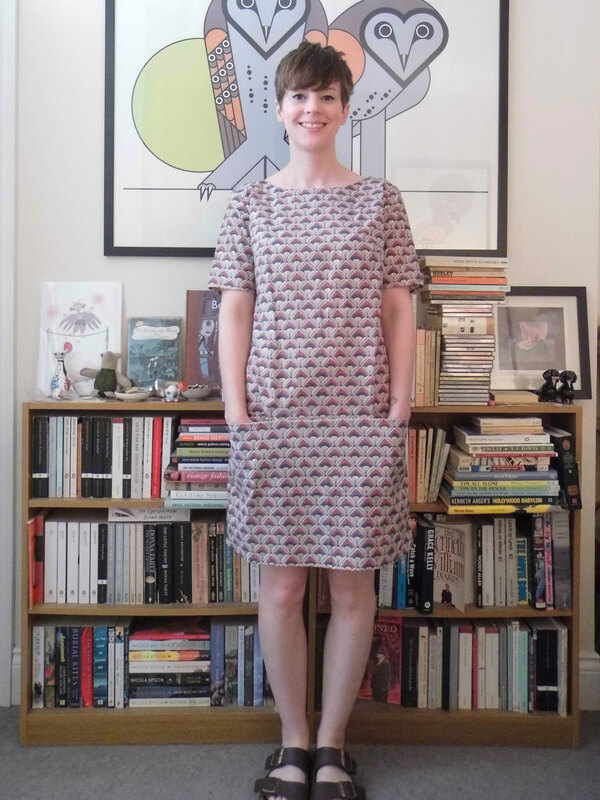 I will say this dress does come out quite short – though it doesn’t look like it in these photos because the camera is looking a little down on me. 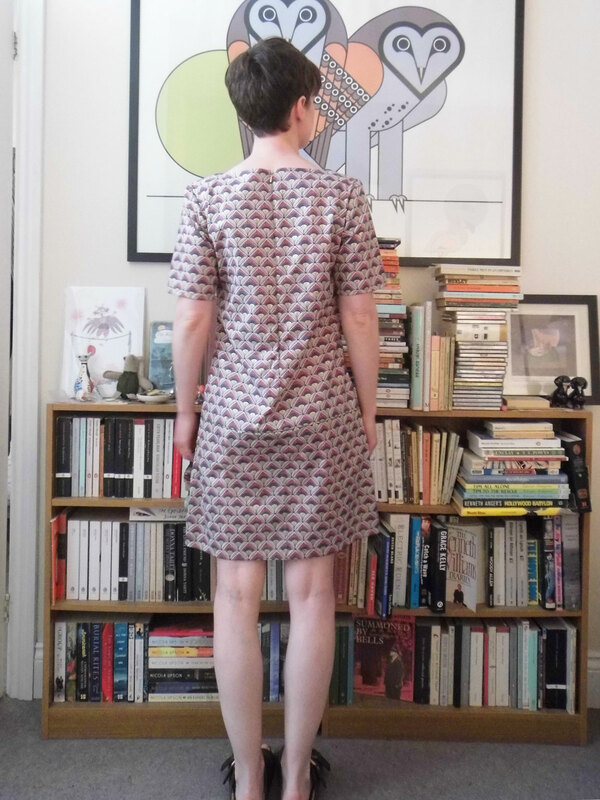 I’m 5’3″ and it’s above the knee on me so if you’re tall you might need to lengthen it a bit so you don’t end up with a tunic instead of a dress! 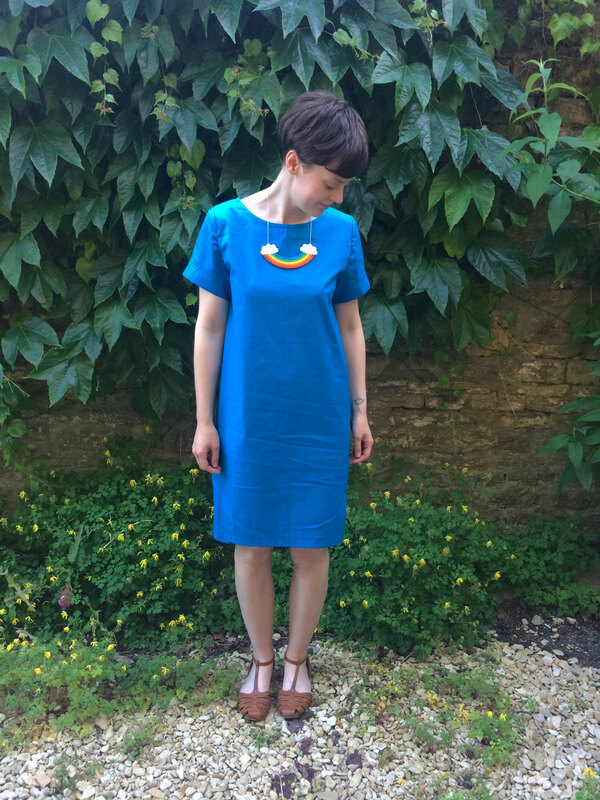 I think, as with the Inari becoming my go-to tee/tee dress pattern, I think the Laurel could become my go-to shift dress pattern now I’ve made it in a size that fits and is comfortable. 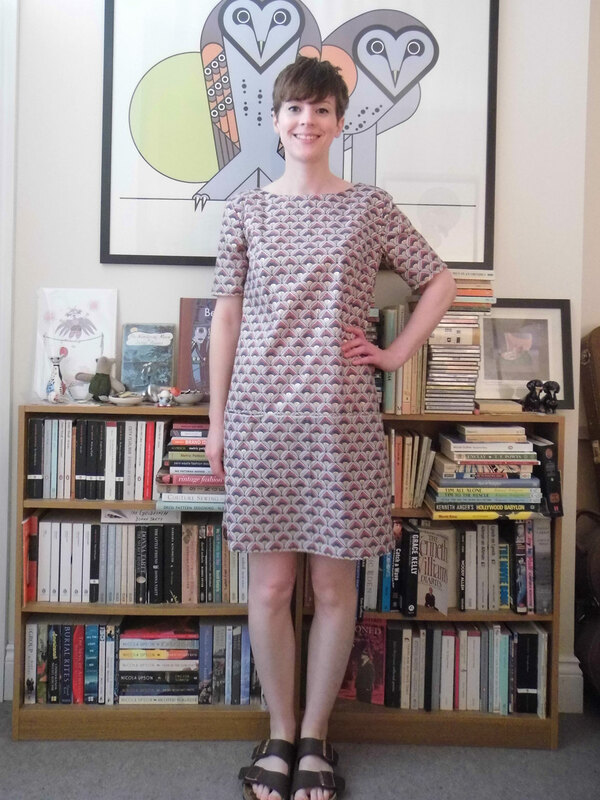 Though I do have the Carnaby Dress cut out and ready to make, so maybe I’ll have 2 shift dress patterns! I think I was running out of enthusiasm for posing at this point?! 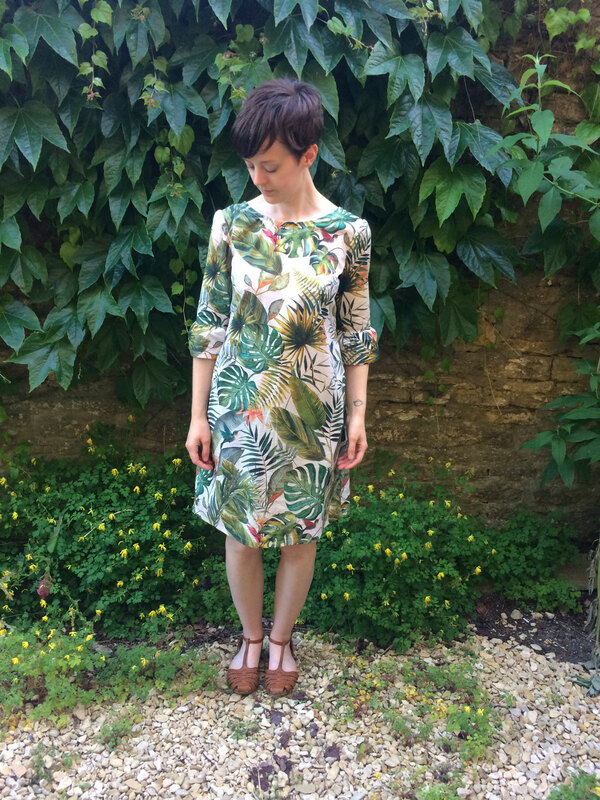 Have you made the Laurel Dress? 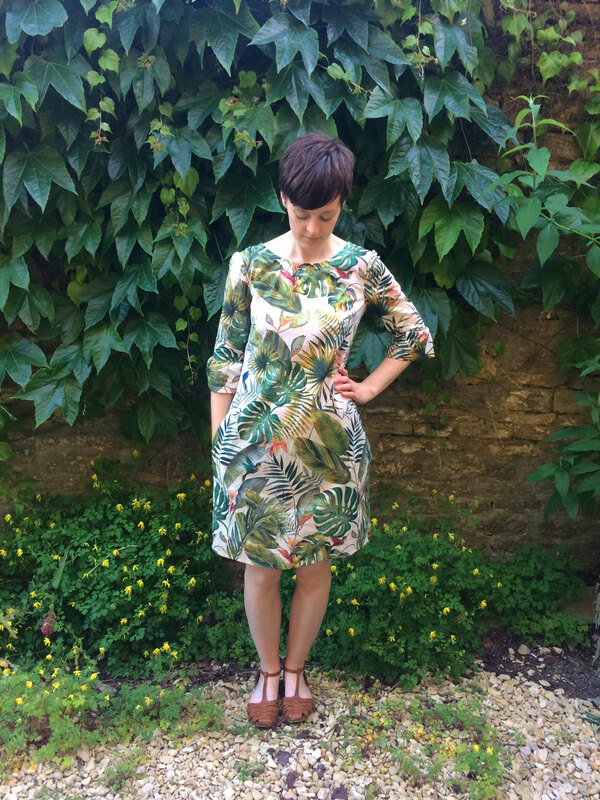 Or rediscovered a pattern that didn’t work when you made it before but now it’s a favourite? I feel like I might revisit some other patterns I’d written off because they were uncomfortable and see if I made the same mistake with the sizing as I did with the Laurel! 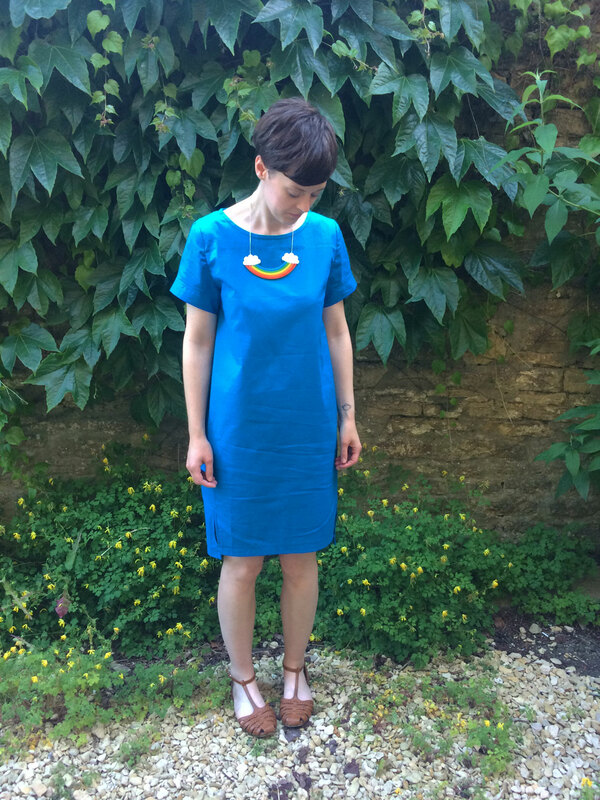 As I mentioned in my Summer sewing plans, one of the things on my list was an Inari tee dress made from some turquoise cotton twill I bought literally years ago and was cut out last year. 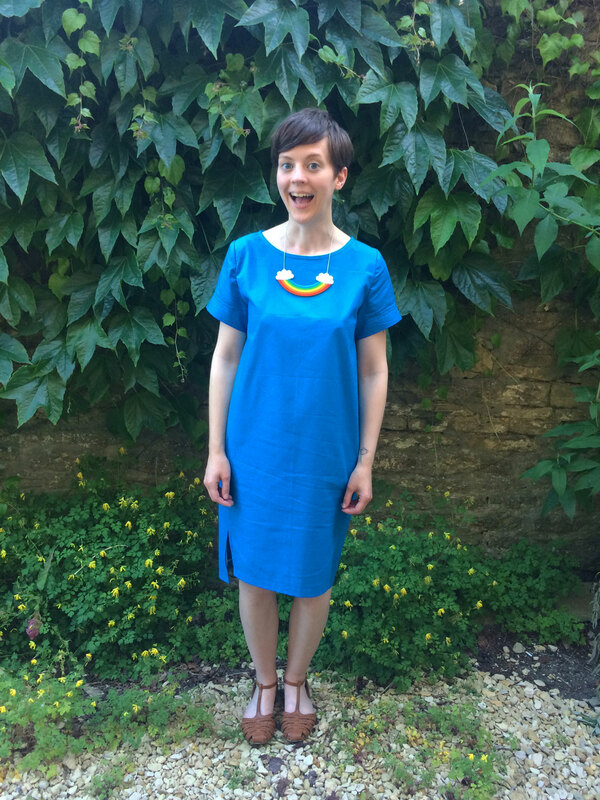 Well this year I made it – it really is a quick sew so I don’t know why I didn’t get around to it last year! I’ve made the cropped tee version of the Inari pattern twice before – once in stripey jersey (which I just added a hem band to to lengthen it a bit) and once in crazy silver fabric for the New Craft House Summer party last year where I won best outfit!!! 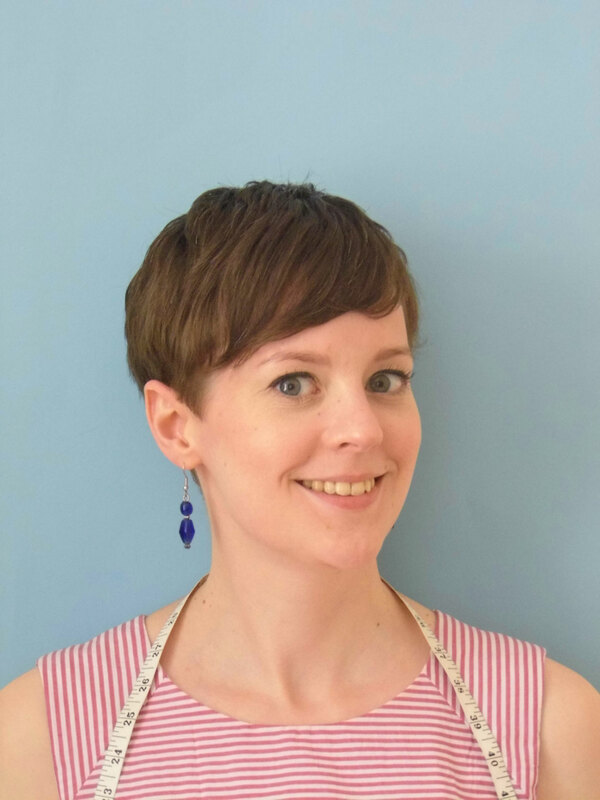 Coincidentally (or not, I don’t know) I’m wearing the Tatty Devine necklace I won at the New Craft House in these photos! The dress felt a little ‘surgical gown’ so I decided I needed an accessory. 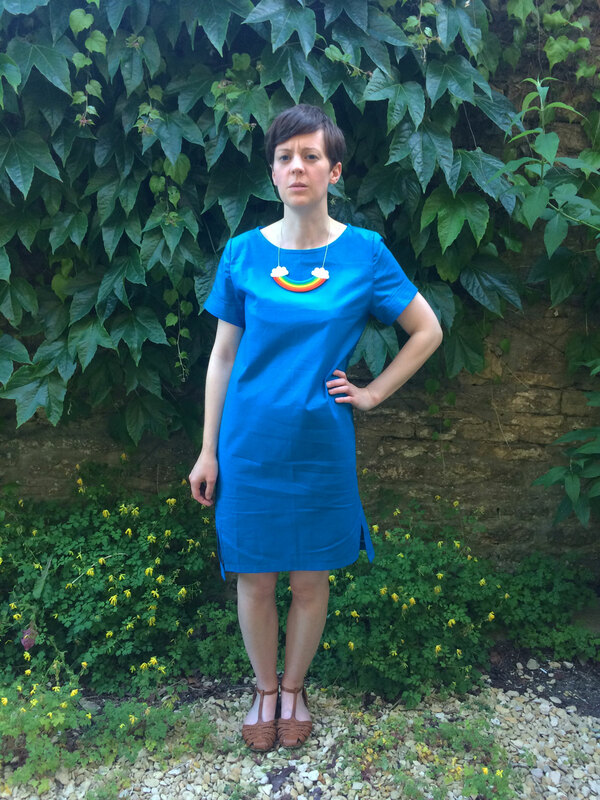 I made the dress in the same size as the tees, which is size 8, and it fits really nicely. 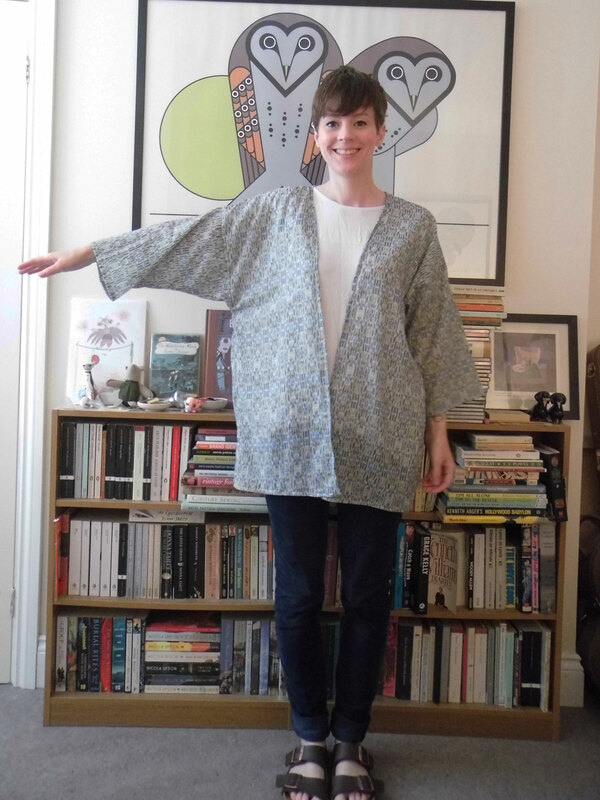 I went through a phase with patterns where when making them to match my measurements, the sleeves and armholes were too tight, making the garment a little too uncomfortable to want to wear, but I’ve not had that problem with the Inari, thankfully. 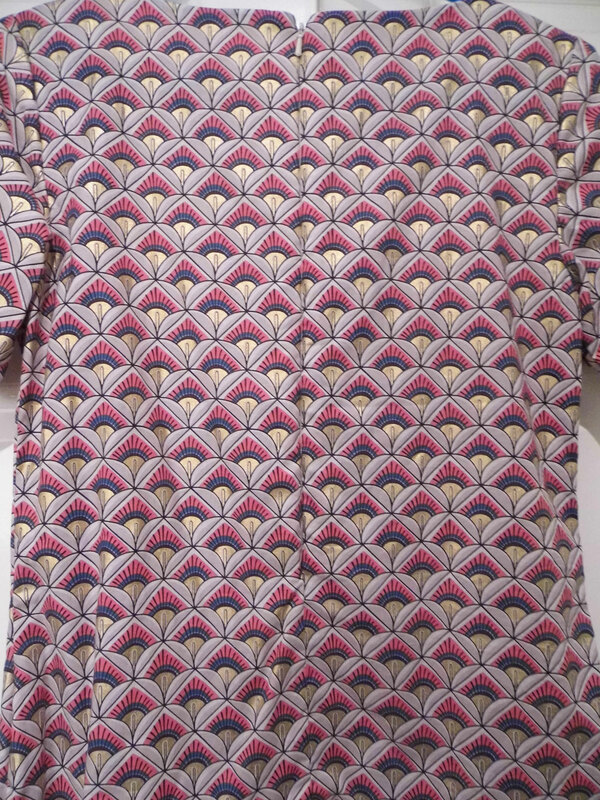 I think this might become my go-to tee and tee dress pattern. 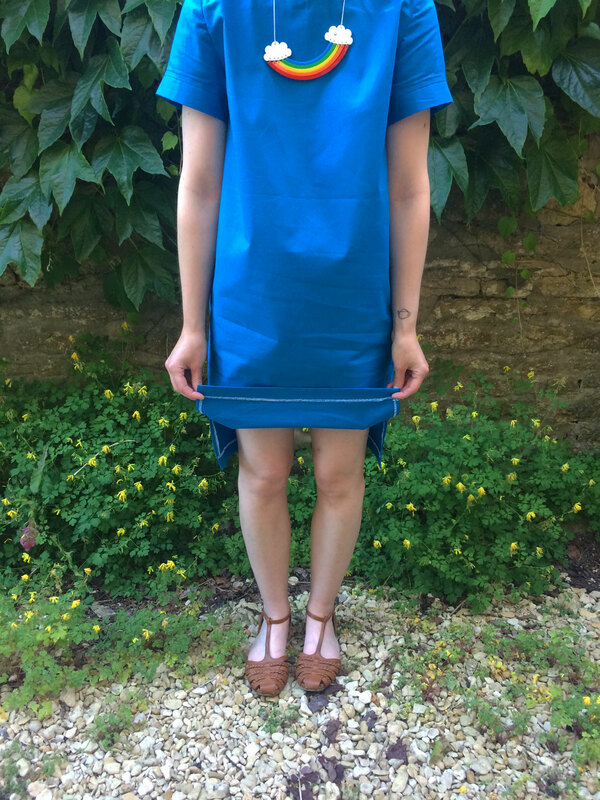 I really love the cocoon-y shape of the dress and the split hem. It adds enough interest to make it not as simple, but it was still really simple to construct and the instructions are perfect. 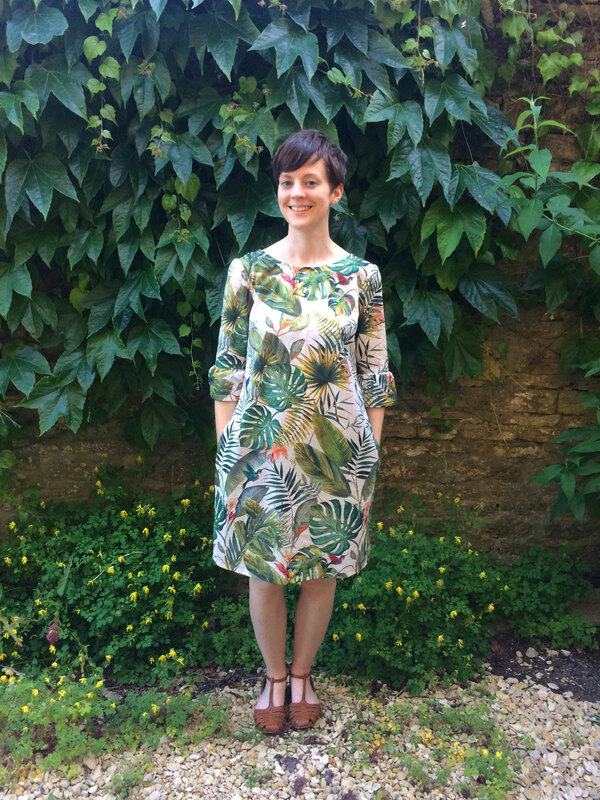 I also love that the sleeves have cuffs – I’m in favour of any design element that means I don’t have to measure and sew a hem. 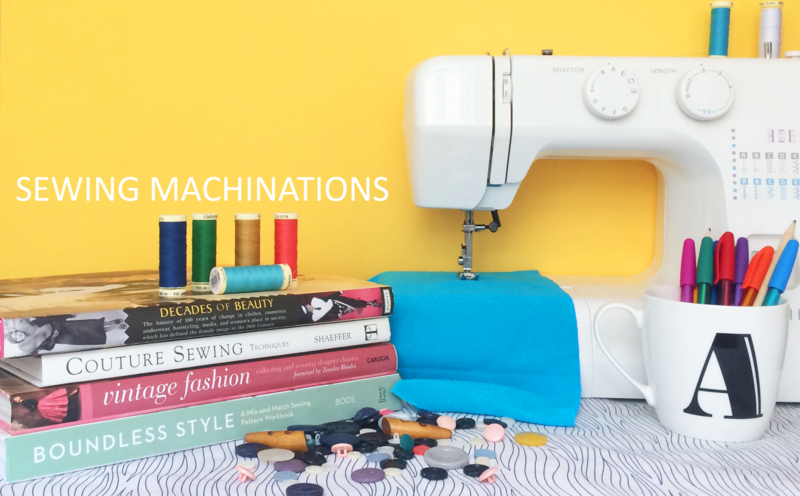 I think hemming is my least favourite part of sewing, though hems never take as long as I think they will! I think my choice of white overlocking thread was adding to the ‘surgical gown’ vibes I was getting from this dress. I don’t know why I thought white would be the best colour – probably because it was already threaded with white! Anyone else do that? Slightly in my defence, the only colours I currently have are black, navy and white. Maybe navy would have been better? 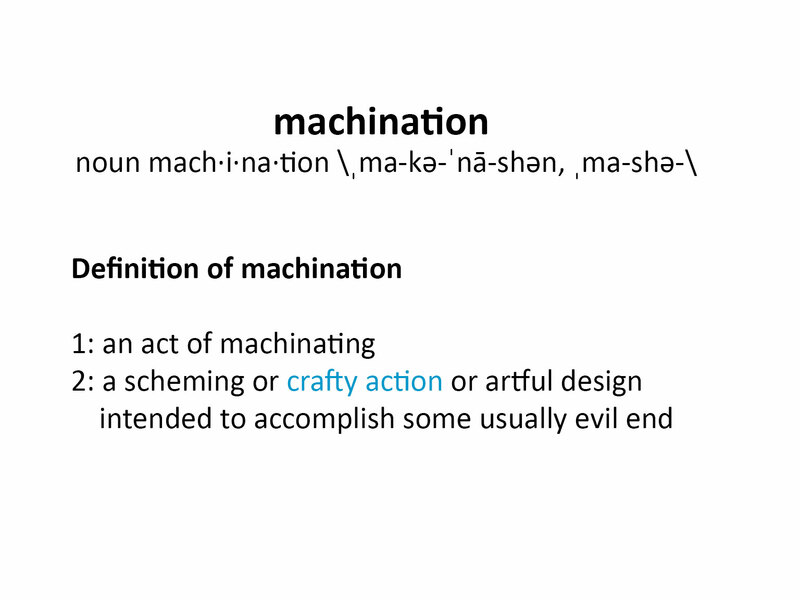 But either way it was never going to match completely. I think I need to invest in some other colours of overlocker thread! At least a mid blue as I do sew blue things fairly often. Today’s outtake is brought to you by ‘what pose should I do next’ face. 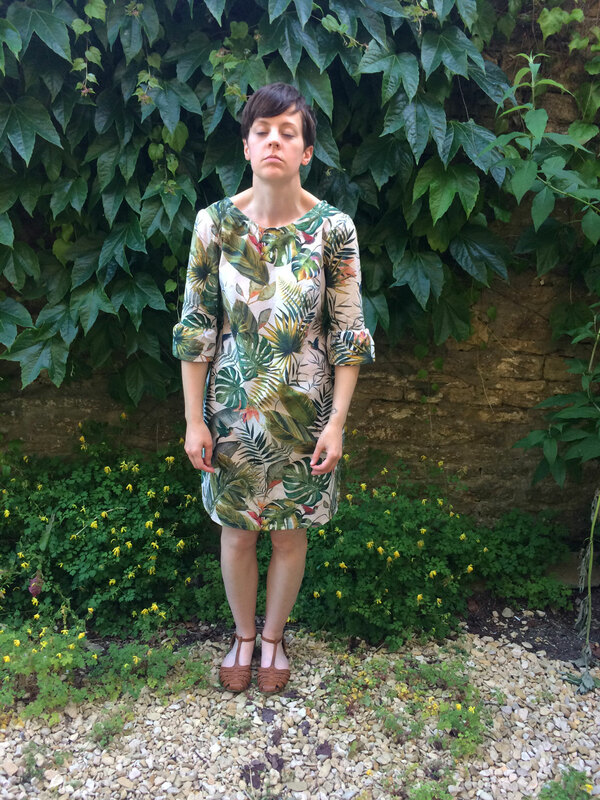 I took outfit pictures of several things at once and this was the last one so I – and the boyfriend – was getting a bit fed up and this is the result! 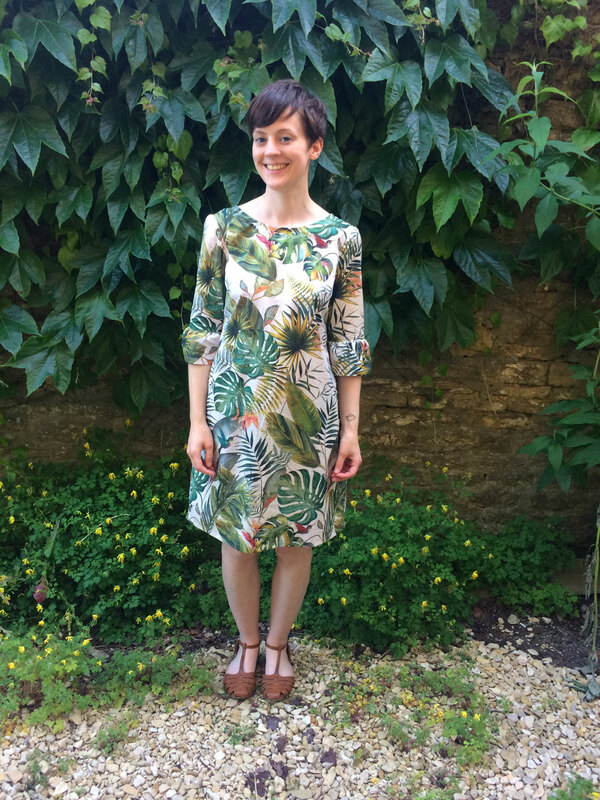 Also you wouldn’t believe how many times I’ve ironed this dress to get it not looking crumpled, to no avail! 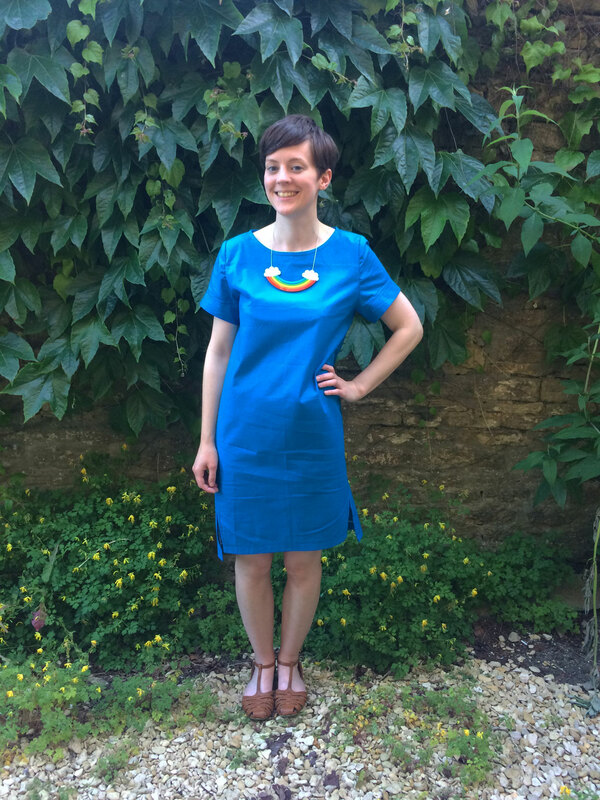 Have you got a go-to tee/tee dress pattern? 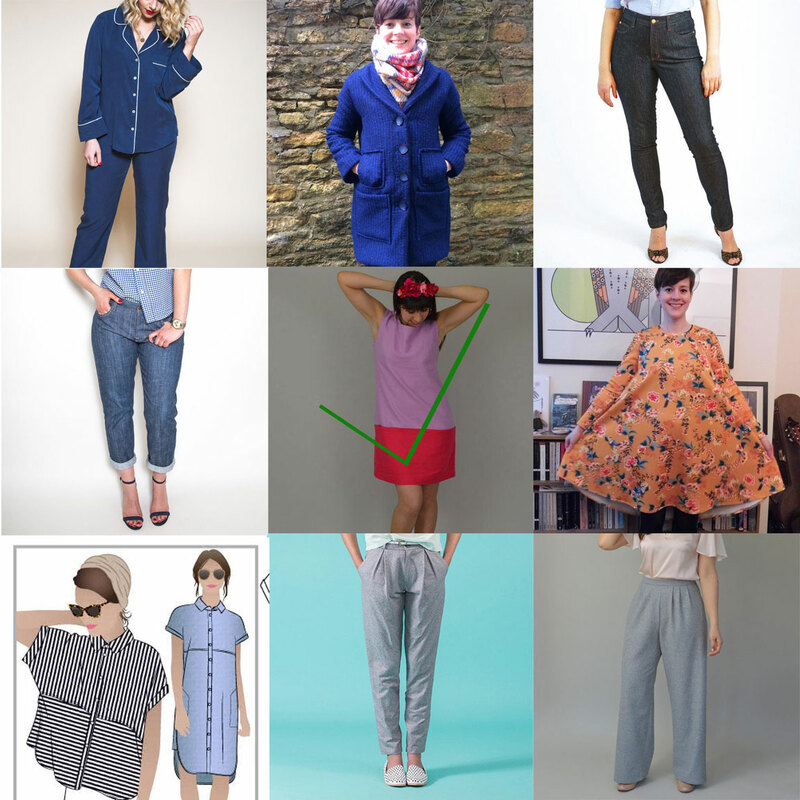 I’m slightly tempted by Tilly and the Buttons new Stevie pattern, but I’m trying to not buy so many patterns until I’ve sewn more of the ones I already have – and especially if I already have a pattern that serves the same function, then do I need another one?